In the footsteps of Joseph Rock 重走洛克路: Choni (Jone, Zhuoni，卓尼) monastery, then and now. Choni (Jone, Zhuoni，卓尼) monastery, then and now. Namse, wealth god, originally uploaded by jiulong. 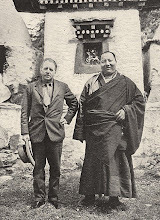 The following few posts show how the monastery at Choni has changed since 1925, when Joseph Rock visited on his way to Amnyi Machen. 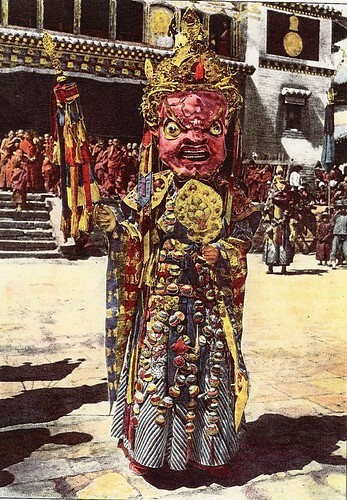 At that time, Choni was one of the major Tibetan monasteries in Gansu, and was also the scene for a murderous war between Tibetans and "Mohammedans". 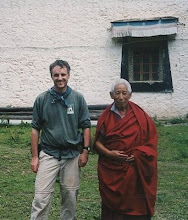 Joseph Rock befriended the hereditary local prince and had an extended stay at Choni while he photographed the many "devil dances". 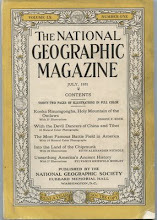 He wrote about it in the 1928 issue of National Geographic magazine. The pictures here are taken from that article. They are crude photocopies, hence the quality is not that good.